Date: 16 September 2018. Delicious Deviled Eggs. I have been told my deviled eggs are something special. I rather suspect that is because so few make them. Basically deviled eggs have been relegated to picnics and potluck dinners. For me however, they are a semi-regular treat. Here are the basics for those who don't want to wait to visit Seaweed for your own batch of delicious deviled eggs. 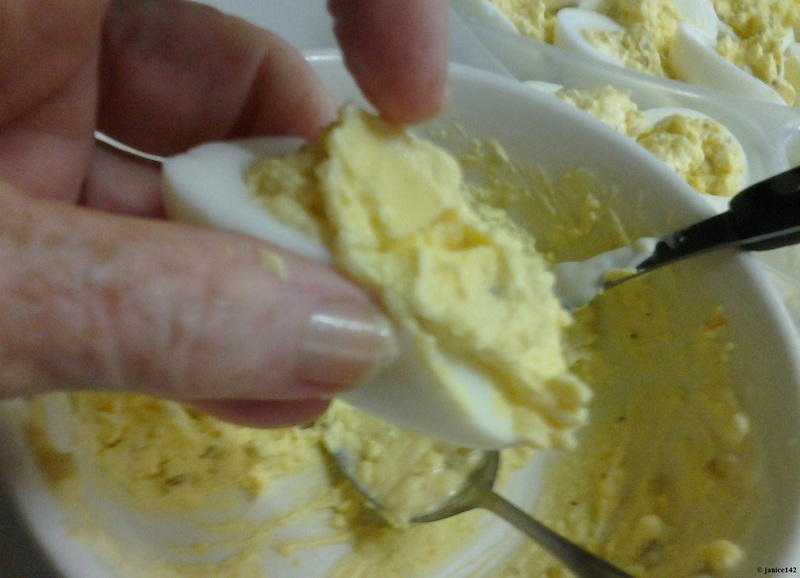 On a hot southern day there is something rather special about enjoying deviled eggs. How-To Primer for eggs: Place eggs and Eggy egg timer in a pan. Cover with water. Put lid on pan. Bring water to a boil. Check Eggy in about ten minutes. It usually takes about fifteen minutes, maybe. I always forget when I start or should check the eggs. That is precisely why the Eggy is such a blessing for me. I can look at the color and know exactly how done my eggs are. Side Note: The Eggy has some sort of heat-sensitive paint on the inside. It changes color to match the color of the egg yolk as it cooks. 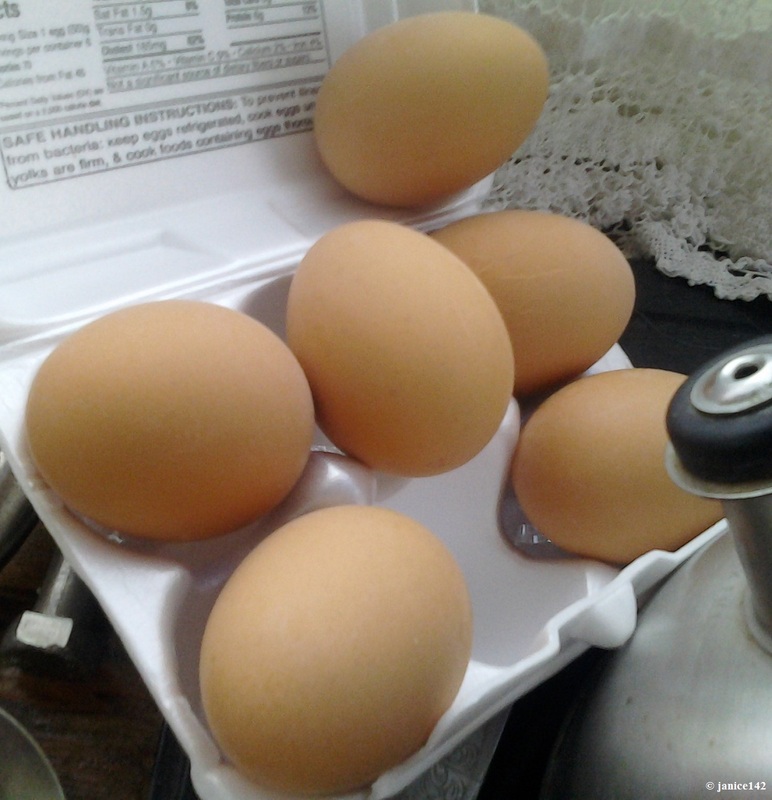 Hard-boil a batch of eggs. I would cook just three if I were only fixing for myself. described in the Perfect Eggs - Eggy Timer (no reefer advice) article. 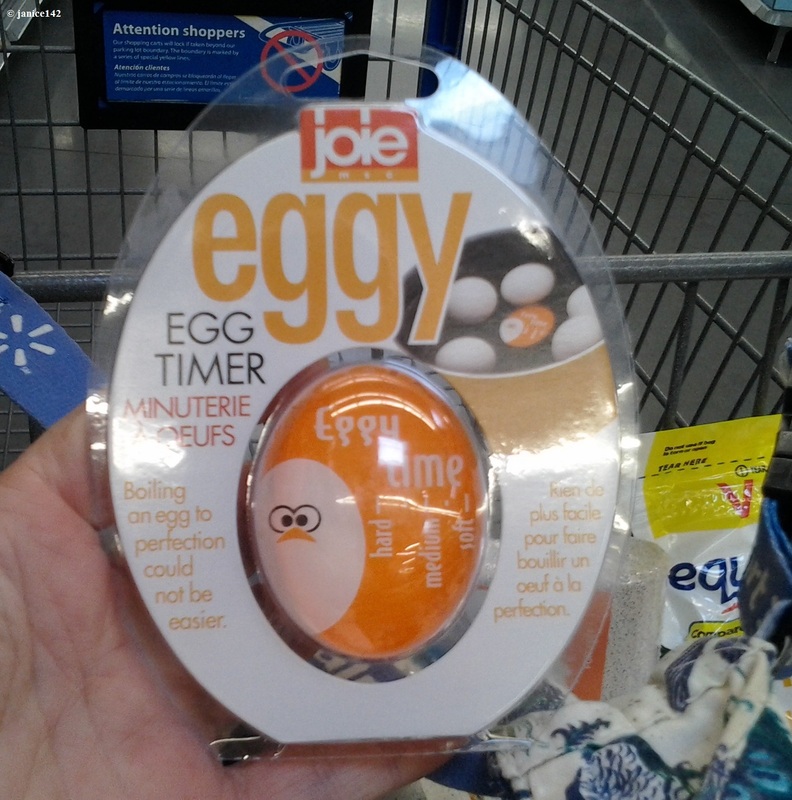 Eggy egg timer ←Blatant plug for the Eggy timer. Though I love my $3 Eggy from Walmart, a friend named Noel said he found a similar one for a just a buck at the dollar store. Gosh, that is a great price. He says mine is prettier. Noel stated the one he bought is solid orange color. Like mine it changes to light yellow when the egg is fully cooked. 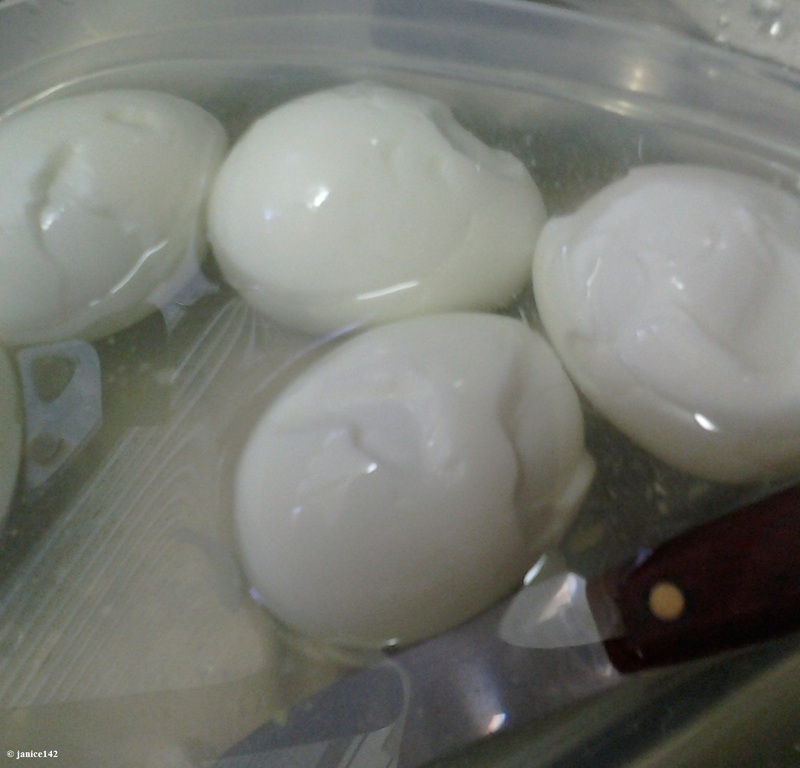 After the eggs have cooled, I then peel them. guests and the eggs will all turn out with the egg whites gouged. Such is life when entertaining. Slice the eggs in half. When you cut the egg in half the yolk will fall out. Place the yolks in a bowl. Mash the yolks with a fork. Make them crumbly. The reason I do this is because sometimes the yolks turn out to have a bit of a green coloring on the outer edge. That happens when the eggs cool too slowly. Though it won't harm me, I don't like the green to show. By mashing the yolks the yellow part supersedes the green. The eggs look more appetizing. The yolks also mix better/easier when fully mashed. Add mayonnaise or salad dressing. 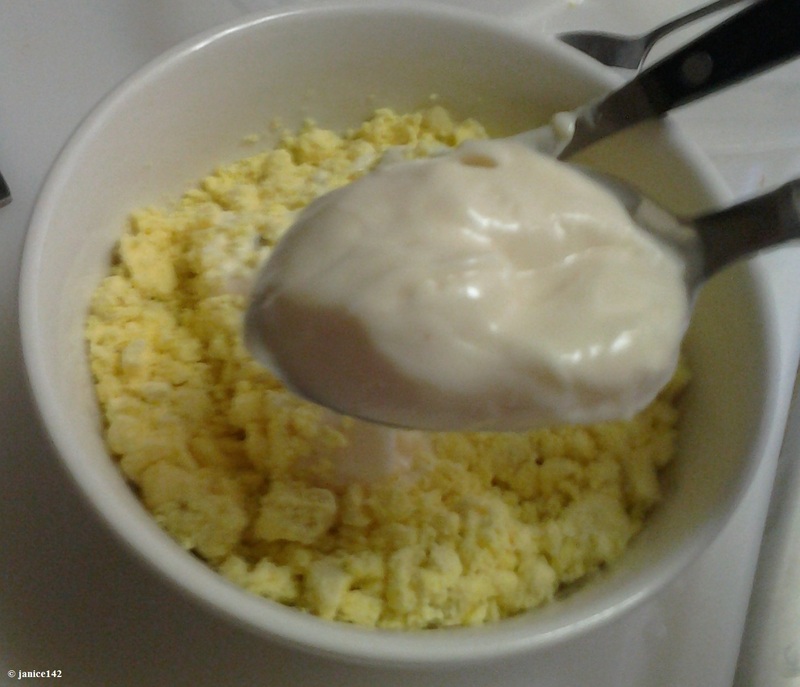 Six eggs calls for a heaping tablespoon of mayo. Salad dressing such as Miracle Whip is to my taste a bit more lemony than mayonnaise. Either can be used in this recipe. Once when I ran out of mayo I substituted Ranch salad dressing. I liked that too. 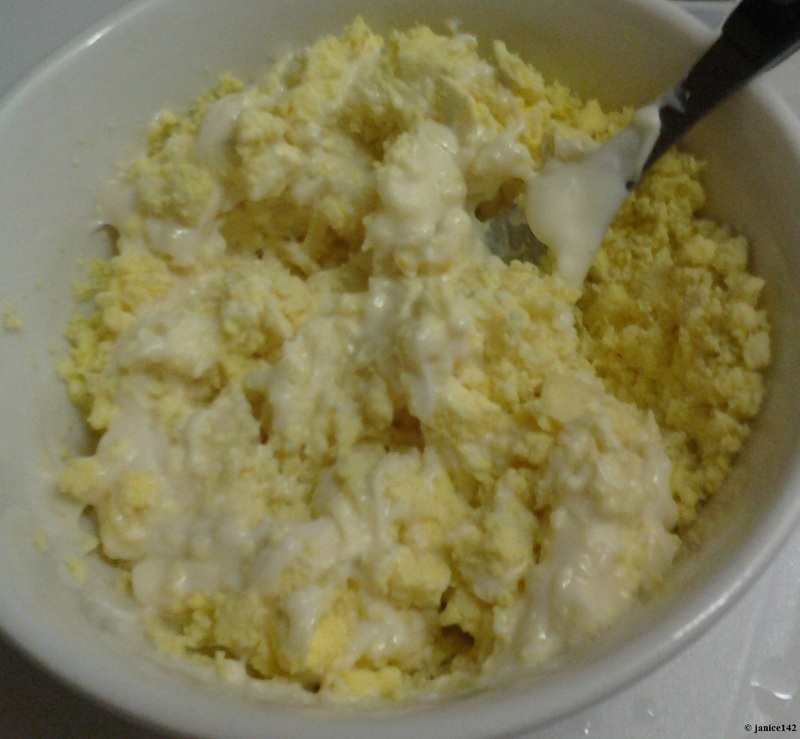 Stir to thoroughly mix in the mayonnaise. If you like relish, add some now. One heaping teaspoon is enough. 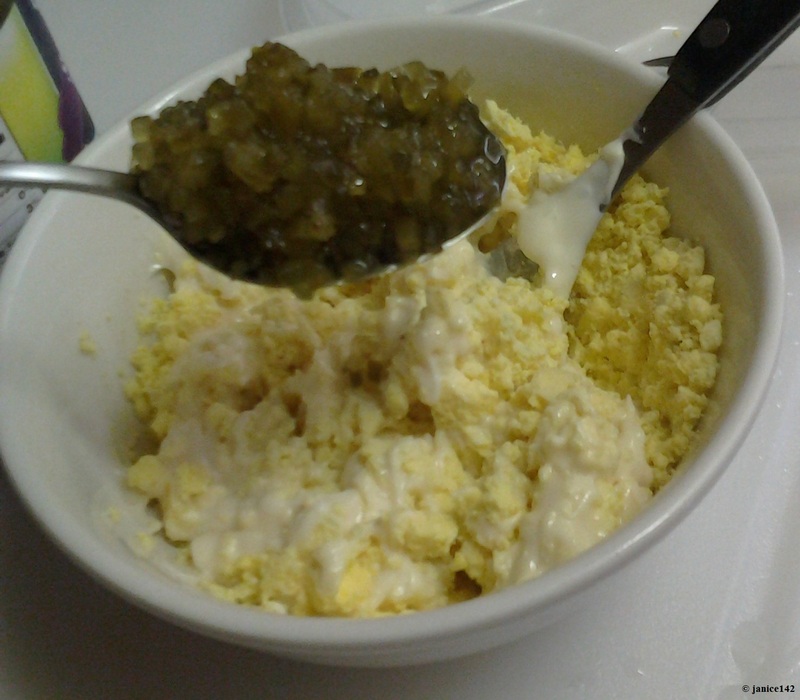 Reminder: Add one heaping tablespoon of mayonnaise plus one heaping teaspoon of relish to the mashed yolks. The ratio is 3 mayo to 1 relish. Frankly though if you are not fond of relish eliminate it. It is not necessary. Southerners seem to prefer relish though folks in north that I know do not use relish. My relatives used diced onions instead. If the deviled eggs are not for sharing I will mince (chop very finely) some onions just for my own batch. Many people do not care for raw onions. That is why I do not add the onions for guests visiting aboard Seaweed. 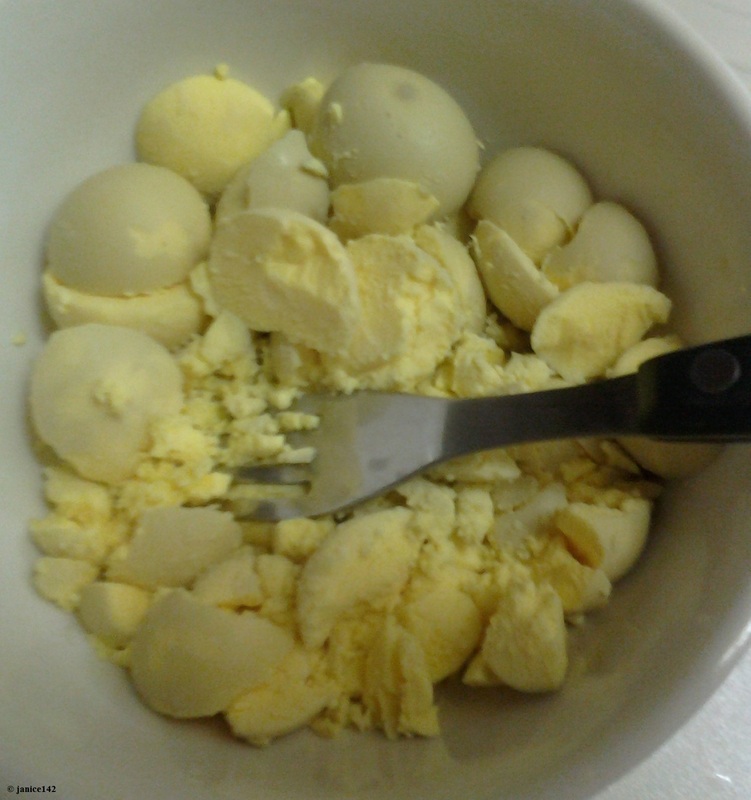 Add approximately one heaping teaspoon of the mixture to each egg half. You've done it. All that is required now is to either eat the eggs immediately or refrigerate until served. I prefer my deviled eggs chilled. Once in a while I get creative and add leftovers from my reefer to the egg yolk mixture. 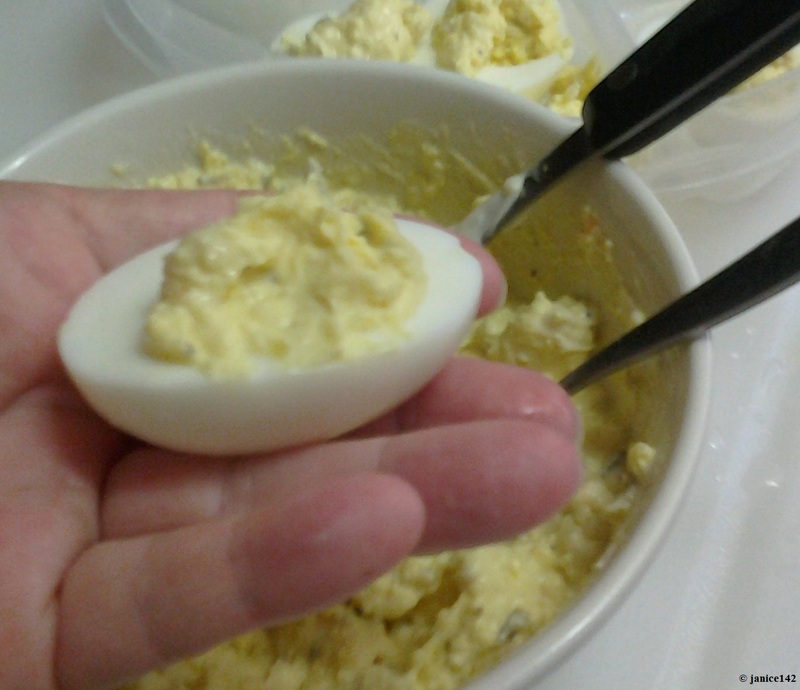 Minced ham and finely grated mozzarella cheese have ended up in my deviled eggs at one time or another. I have also used a smattering of garlic seasoning on occasion. Now most folks at picnics and such seem to add the spice paprika (the red stuff) to the tops of deviled eggs. Paprika is a type of pepper. I am not fond of the flavor so no paprika is ever used for my eggs. When cooking/fixing for others I do not add salt. It is always better to err on the side of too little than too much. So many are on restricted diets, therefore I try to be accommodating. Deviled eggs are a personal favorite. I make them for every potluck, and for me too just because I like them. Here in St. Petersburg the Red Tide has arrived. My eyes are scratchy. Breathing is not easy. I am spending a lot of time in the boat running my air-conditioner. 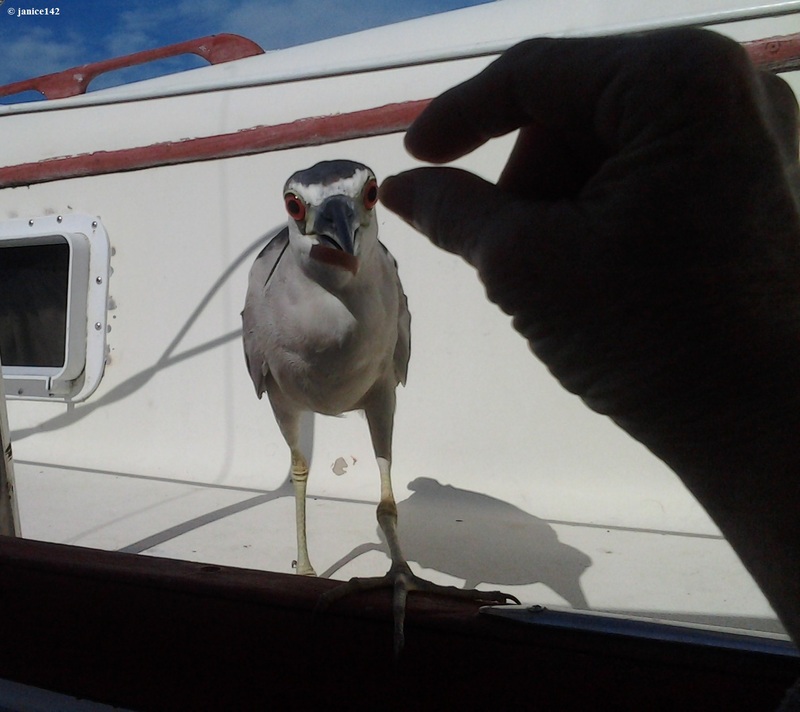 Outside activities are curtailed though I am out there feeding my birds. I worry about them. Bruce likes his hotdog wafers. 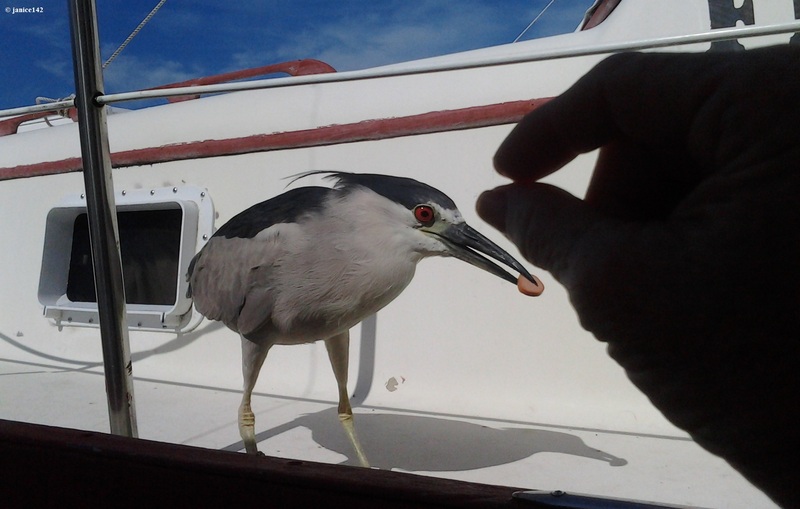 Because of the red tides I have been feeding the night herons and my snowy egrets more of late. I worry about them. 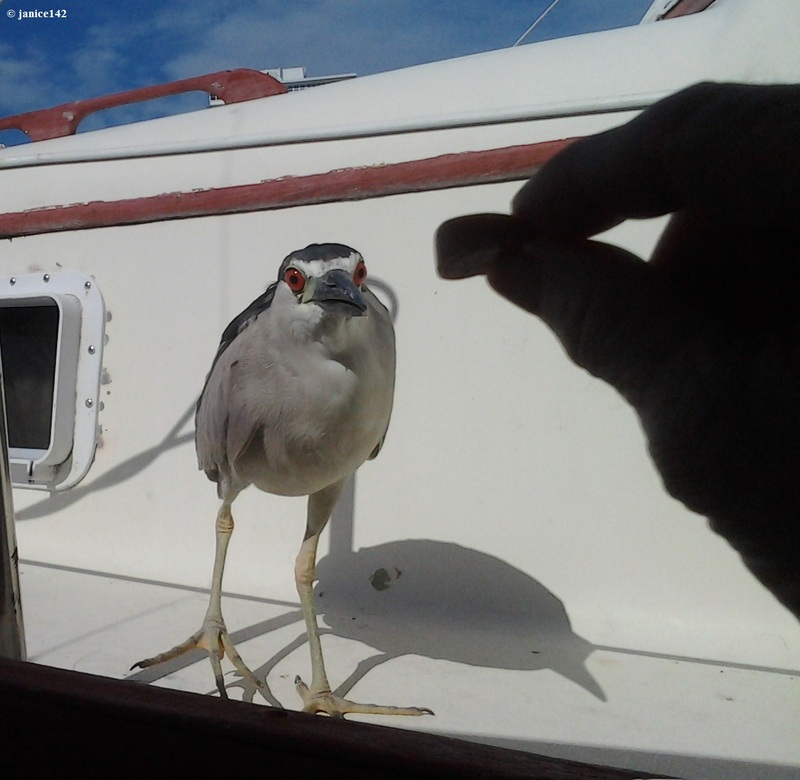 Additionally they will stand on the boat and stare at me until I break out the container of hotdog wafers. One of us is well trained. So far I am not seeing dead fish here in the canal. We do get an influx of contaminated water on rising tides. It is not pleasant. I don't believe I was nearly sympathetic enough when friends further south were discussing their plight! For now that's it. Stay happy, breathe well and thank you for reading. I'd love to hear what special things you add to your deviled eggs. And, have you one item you bring to potluck dinners or does it change each time? A favorite aphorism: It's a good thing not everyone has a smartphone. Someone has to honk when the light turns green. Grumpy Cat.